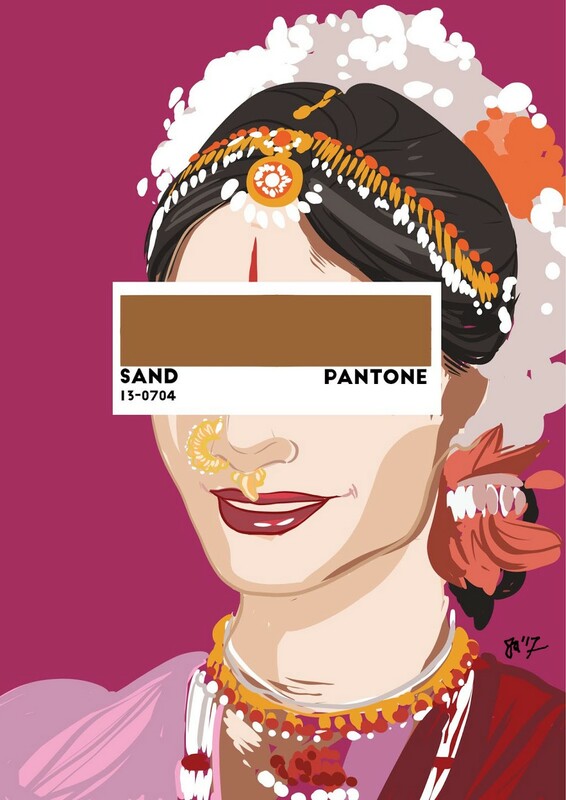 Last week, artist Tara Anand began posting curious illustrations to her Instagram: girls of varying brownness smiling as their eyes were shielded by Pantone color cards. 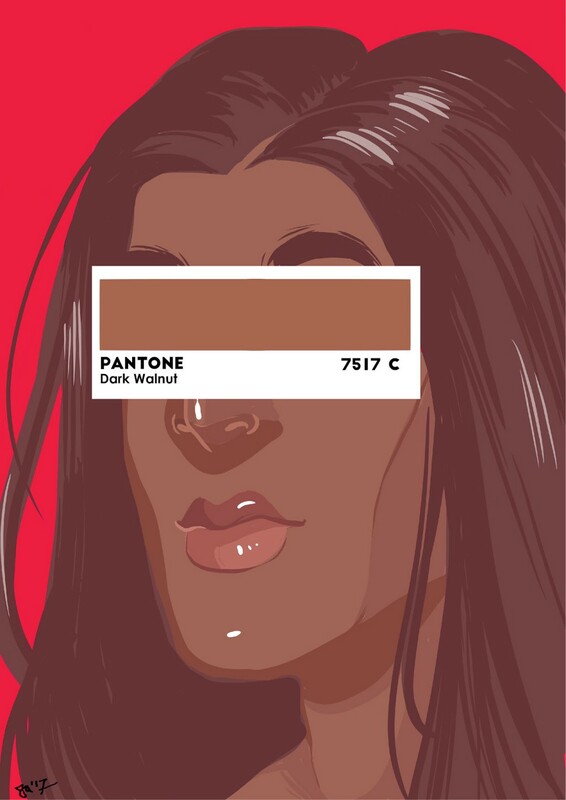 Shade Card, an art series illustrated by Anand and captioned with poetry by Anoushka Agrawal, set out to explore colorism in the South Asian community. 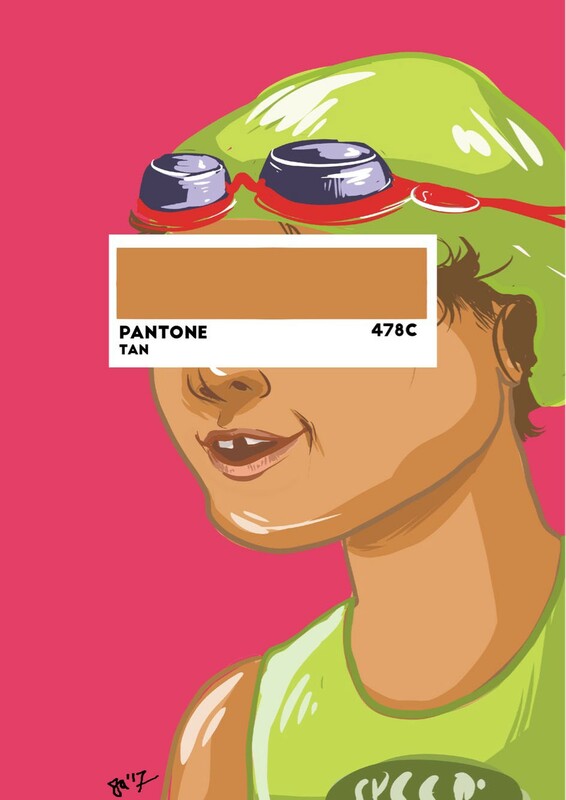 Tan, 478C. Wheatish, 7644C. These women were paint chips. And under each illustration was a poem about skin. How it feels, how it looks, how others see it, how we are punished and judged for it. Kajal spoke with the poet behind the words, Anoushka Agrawal, about why she felt this project was so important. 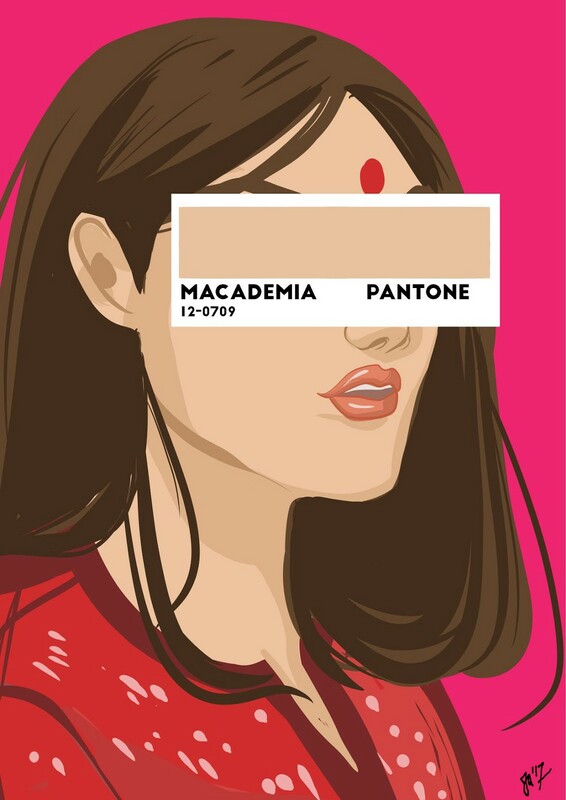 The Shade Card series, Agrawal said, was about exploring colorism and how it affects us so deeply. Complexion and beauty “should have no correlation,” she says. Check out every piece in the series below. Earrings dangling from her ears as sweat dangled from the apex of her chin. Had begun to ache with the long hours of rehearsal, but she didn’t mind. Within her the beauty that she had for years not been able to trust. When she danced, she transcended universes; reality turned to dust. To her own self. 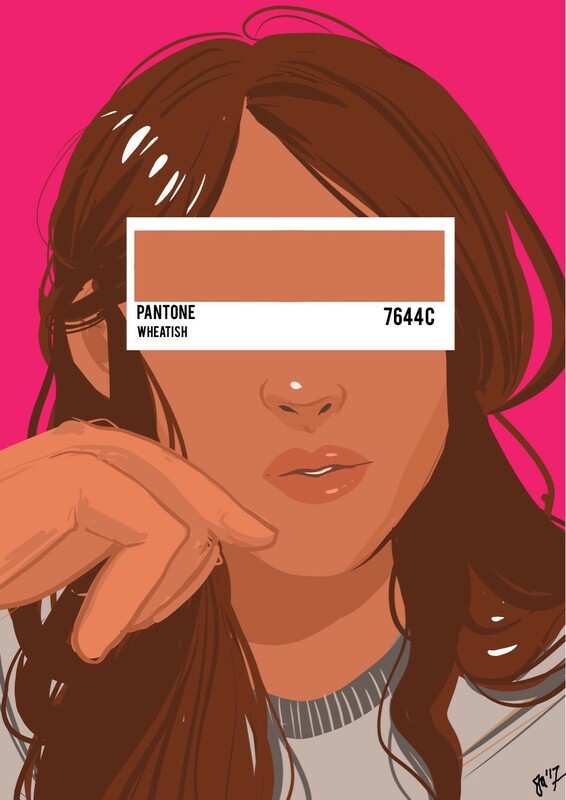 Never before had she been more conscious of her complexion. As she pulled her friend, the thief, into the jail. She could never lose, not without a fight. As she ran out again, to catch the other thieves who were waiting to be found. She flew through the hallways, ran up flight after flight of stairs. Picked up their water bottles as the school bell yelled, calling to midday. ‘I’m telling you, she cheats. How else can she be that fast? ‘She’s too dark.’ The girl stopped and stayed right where she was, alone. She didn’t want to fight anymore, she didn’t want to win. She slumped back into her seat, dejected, discouraged, unstirred. Historic train stations, art galleries, beaches that stretched for a thousand miles. Face back towards the window, and watched her city speed by. people. The city that didn’t discriminate; the city that was happy. 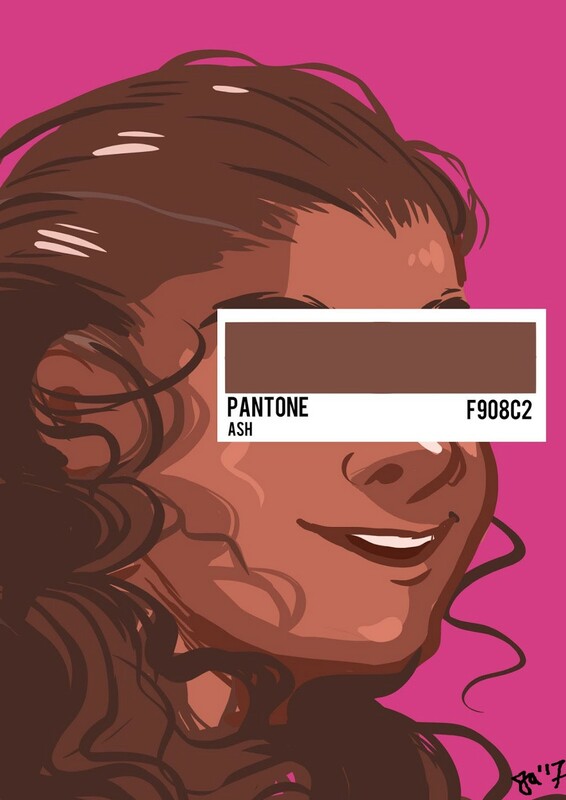 Changed shades, getting lighter and lighter with every base. Her costume, her choreography, her concentration, her confidence. That’s all she needed, didn’t she? On each arm, and tightened the gold belt on her hip. Covered her arms with the colour; from her shoulders down to the tips of her hands. How much the world had changed from when her dance form was first created. To change the narrative, to tell stories from the nooks of reality; to flower. Into a traditional dance form, and a seemingly traditional society. She tilted her head. The fish swam right and left, up and down; in all directions. Goggles, and, standing in front of her mirror, she fitted them on her head. Jump and merely float, all at the same time. The water made her powerful. remotely wrong with a tan. She laid out her brand-new lehenga on her bed, admiring it. And the glimmering lamps; the exquisite food and all its other quirks. She rang the doorbell and greeted her friend with an embrace. It was common knowledge that she knew absolutely everything about Hindu mythology. Didn’t realize that her complexion could strip her off her culture completely.